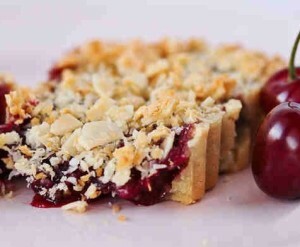 Flaky pastry crust filled with sweet and gooey cherry filling then topped with crunchy coconut-almond crumble. Here is an easy dessert recipe for Cherry Coconut Pie. Prepare the filling. In a large bowl, combine cherry pie filling, lemon juice, cinnamon and 1/8 teaspoon salt; gently mix until thoroughly combined. Transfer mixture into pie crust and bake for 20 minutes. To make the topping, combine coconut, almonds, sugar, milk, egg, butter, almond extract and remaining 1/8 teaspoon salt in a medium bowl. When pie has finished baking, sprinkle and spread topping evenly over pie. Return to oven and bake for another 10 to 15 minutes, or until crust and topping are golden brown. Allow to cool before slicing. Serve with a scoop of ice cream or dollop of whipped cream if desired.